Welcome to Bristol Core. We are an American manufacturer specializing in muffler packing for motorsport. If you are a rider or builder looking for high quality material to pack a muffler with, you've come to the right place. Off road riding can be torture on muffler packing. We offer packing kits and materials designed for the heat and revs of two stroke (RaceTEX) and four stroke (Spec 19) motocross, ATV, UTV and adventure bikes. Riding a big twin and need to repack? Maybe your muffler is getting too loud and what originally sounded great has developed a sharp "crack" sound. You can rely on our high-end SPEC 19 for a packing system that will hold up to many, many miles of riding. Sportbikes with aftermarket mufflers sound awesome, until the packing blows out and it starts sounding like a big empty tin can. We can help you restore the rip and roar with materials that will last. If you need some assistance deciding what materials or kit will work best for your application, feel free to either call us at (585)-919-0302 or send an e-mail to info@bristolcore.com. We're available Monday through Friday 8am to 5pm Eastern. FITMENT - This pillow will fill a four stroke muffler with a shell up to 4.25" in diameter (13.3" in circumference) and up to 15" in length including the end-caps if they are packable. 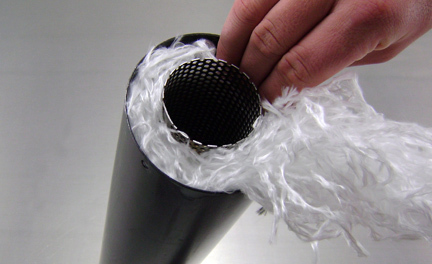 Cut to length pillow design utilizing our newest high temperature packing material for up to 1500F continuous duty. Designed for extreme duty four stroke temperatures. Compressed pillow designed for easy installation. Contains 575 grams of Spec 19 packing material FITMENT INFO - This packing kit will fill a silencer up to 16" long (including packable end-caps) with a shell diameter up to 3.75" (or an equivalent 11.75" circumference). Extreme duty temperature material for longest lasting two stroke packing available. Contains 320 grams of Spec 19 packing material. FITMENT - This pillow will fill a four stroke muffler with a shell up to 4.25" in diameter (13.3" in circumference) and up to 19" in length including the end-caps if they are packable. We offer flat rate shipping to the lower 48 states! Express orders placed before 3pm EST will ship the same day. ATTENTION INTERNATIONAL CUSTOMERS - Please email us sales@bristolcore.com to place an order. Thank you. Copyright © Bristol Core, Inc.. All Rights Reserved.